We kicked off Cycle 3 of the #21daychallenge with over 1250 people who signed up to improve their lifestyle and create healthy habits with us! We are so happy to have you and to share some easy tips that will help you prioritize your workouts and prepare your healthy meals with ease to crush this challenge like the boss you are! We all see the fitspo people on Instagram who seem to have nothing to do but workout and make smoothies. Although that would be awesome, that is not real life for 99% of us that have school, kids, jobs, relationships, and all the responsibilities that come with being an adult. In life, there are times we can manage it all better than others, and during this challenge, you are going to learn how to prioritize your health so you can operate optimally and feel good from the inside out! Over the weekend I showed our followers on IG how I prep the food I got from my trip to Trader Joes in my refrigerator. I chopped my veggies and put them in separate containers. I made two different pots of soup, cooked some quinoa, and roasted some beans for easy salad making for the week. Bradford and I eat a lot of soup and salad because it tastes fantastic, it is super healthy, and it is filling and satisfying. What more could you ask for? When you are cooking healthily at home, chopping your veggies ahead of time is going to make your life so much easier! You can make a fresh salad in minutes, add vegetables to a stirfry, or have ready to go snacks on hand. Soups and chili is the perfect go-to healthy meal to have ready in the fridge on long days when you don't feel like cooking. It makes a leisurely lunch or dinner that is hearty and healthy and exactly what you need to avoid opting for fast food out of convenience. Head over to my recipes to make some of my favorites like this veggie chili! Do you ever pack a salad for lunch and are grossed out because it gets soggy? I have! Then my life was changed forever when someone showed me this little trick for packing salads on the go. Use a mason jar and start with the dressing on the bottom and layer up with your lettuce on the top! Bring a bowl with you and mix on site! Boom! Fresh and crisp salad. You can also prep several salads in jars on the weekend and have them ready in the fridge for your busy work week! 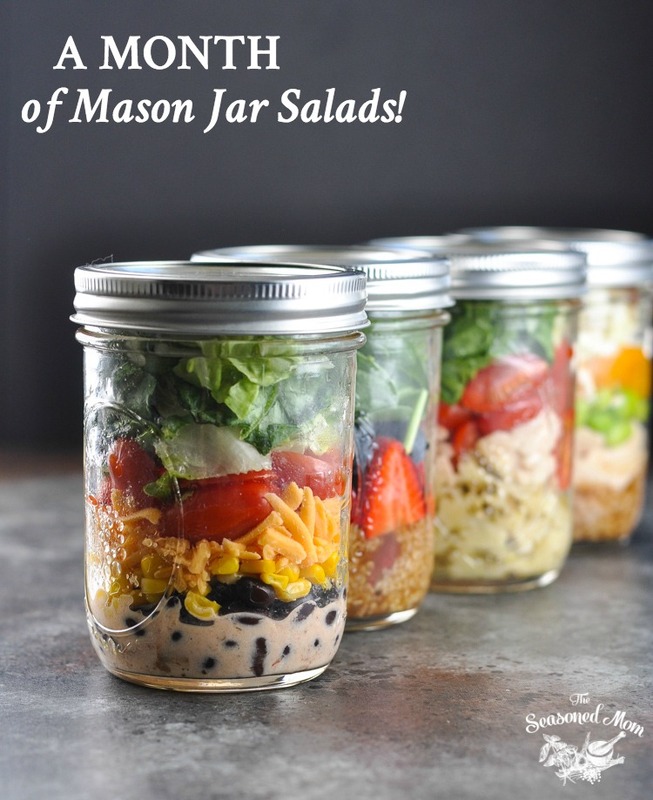 Here are some mason jar salad recipes to try from Pinterest! Just click the photo to get all the yummy details. Now you have some tips for food preparation, let's talk about prioritizing your time and schedule to fit your workout in. I know, it is hard! I travel often, I have a two-year-old, plus I have a Ph.D. from Harvard in excuse making so let's just say it is a struggle. Here are a few things I keep in mind when I think about doing anything other than workout out or move my body. I remind myself it is just 30 minutes a day! Seriously, we are scrolling on Instagram for hours and hours, and I don't have 30 minutes to care for my health and wellbeing? The truth is you make time for what you care about, and I realized I need to care about myself. So don't over think it.... just a little reminder that says, "I need to care about myself and I have 30 minutes for my health" is a pretty powerful thought! With my crazy schedule, I have to plan. On this challenge, I will be traveling to Miami and Bora Bora! But I am going to get my workout in because I am making it a priority by planning. There will be one day of traveling I won't be able to exercise so I can do a little extra here and there to balance it out. No big deal. Take a look at your schedule the night before and see when the best time will be to fit your workout in the next day and make it happen. As people, we tend to commit to doing things for others and feeling bad if we need to say no. Ironically, we have a hard time committing and following through with the promises we make to ourselves. For the next 20 days, this is your time, and you can give yourself permission to put yourself first. Say "no" to people and situations that aren't contributing to the positive and healthy lifestyle you are trying to create for yourself. You are allowed to do that. If they as why, just say, "I am focusing on keeping the promises I make to myself." Then do your thing. You got this.